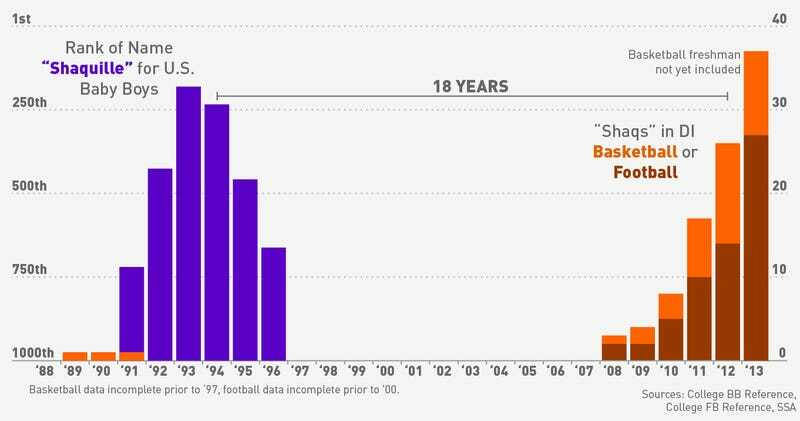 Infographic: Are College Sports In The Midst Of A "Shaq Boom"? Over on his blog, Ken Pomeroy makes a convincing case that we're in the midst of a "Shaq Boom." The babies named "Shaquille" that were born in O'Neal's heyday in the '90s are now turning 18 and entering college basketball. The name "Shaquille" first entered the list of top 1,000 baby names in 1991 (720th) and peaked in 1993 (181st) before dropping off, never to reappear. With perfect timing, the first modern "Shaq," Shaquille Johnson, started playing at Marshall in 2008, 18 years after the end of O'Neal's freshman season. Since then, the number of basketball Shaqs has swelled to 11 for the 2012-2013 season, by Pomeroy's count. Pomeroy's research is awesome, but it may be too narrow in scope. For one, he's looking only at players who account for at least 10 percent of their teams' minutes, as if a Shaq who rides the bench isn't a real Shaq. Secondly, he cares only about the basketball Shaqs. What if these Shaq babies ended up better suited for football? Are more Shaqs appearing on the gridiron as well? To find out, we compiled our own data from the College Basketball Reference (complete back to 1997-1998) and College Football Reference (complete back to 2000 for FBS) databases. The chart at the top plots the number of Shaqs participating in these two sports from 1989-1990 to 2012-2013, plotted against the rank of "Shaquille" as a baby name. The inevitable decline may be underway in basketball: ESPN's recruiting database listed 12 Shaqs in the class of 2012, plus one Shaquan, but just three in the incoming class of 2013. For football the boom is just getting started: Already 13 freshman Shaqs are on rosters for the 2013 season, more than double the six Shaqs who debuted in 2012. Is peak Shaq still to come? 2011: Shaq Washington (Cincinnati), Shaq Rowell (West Virginia), Shaq Petteway (West Virginia), Shaquil Barrett (Colorado State). 2013: Shaquille Tolbert (Army), Shaquille Roberson (Alabama-Birmingham), Shaquille Murray-Lawrence (UNLV), Shaquille Love (Kentucky), Shaquille Jones (New Mexico), Shaquille Hunter (Arkansas), Shaquille Huff (Middle Tennessee State), Shaquille Harris (Massachussets), Shaquille Fluker (Georgia), Shaquille Griffin (Florida), Shaq Wiggins (Georgia), Shaq Lawson (Clemson), Shaq Anthony (Clemson).